Imported from the national grid (100% GreenPower) = 1242.7 kWh @ 24.88c per kWh = $309.18 debit. Exported to the national grid (my solar PV) = 488.3 kWh @ 66c per kWh = $322.28 credit. Not taking into account the network connection fee of about $50 for the quarter, that is a grand total profit or credit of $13.09! As the meter has been read today, I should receive the bill in the next week. Fingers crossed that my calculations are the same as the electricity retailers. Not bad for the hottest Summer on record, and the longest warm spell of days over 20C ever in Melbourne. The air-conditioner got a workout for a fair bit of the billing period due to Kim’s MS as we tried to keep her cool and reduce the fatigue. Not very energy efficient, but that is just the way it is. I am going to monitor our electricity usage weekly for this quarter so that I can determine whether we will remain in the black. This billing period is usually our best season for energy efficiency, due to cooler weather, and with mainly sunny days, there is a good chance that we will export a fair bit of electricity during the day. Solar PV is definitely worth the investment if you can afford it. Now that most states in Australia have some sort of feed-in tariff, the payback period for your investment will be even shorter. I Have The Power… At Last. The ongoing saga of being paid the Victorian Premium Feed-in Tariff for the net electricity that I export into the grid from my Solar PV system is finally over (I hope). Since this post, titled ‘How Hard Is It…’, many things have transpired. Firstly, I was called by Origin new connections and they confirmed that my new electricity meter would be installed on January 8th, between 1200-1600. So far so good, I thought because we were getting a bit of action, but two weeks later than I expected. Apparently, the 21 days was for them to contact me with a date, not to install the meter. I worked from home on the 8th waiting in anticipation, only to be disappointed at 1600 when no one from Powercor, who were to perform the installation, turned up. I jumped straight on the phone to Origin to get them to sort it out. I received a call back in about 10 minutes telling me that Powercor had computer issues and my work request had failed to be sent to the installation team. I asked for Powercor’s direct number because my beef was not with Origin, and so that I could rip them a new one (hey it worked once already). I talked to Powercor’s new connections team, who duly apologised in the lamest possible way, and proceeded to book me into the next available installation slot of the 8th of February. Well, to say that I lost the plot was an understatement. Kim said that she could see steam coming out of my ears. The poor bloke on the other end didn’t know what hit him as I promised to get the Electrical Ombudsman involved for loss of earnings. He began to back pedal really fast and said that he will check with his supervisor to see if they could fit me in earlier. Hell, that felt good! Twenty minutes later, I get a call back from Powercor. The apology was much more sincere this time, and they told me that they could now fit me in on the 21st of January from 1200-1600, and they were going to wave the $167 installation fee. Well that was much better! I accepted their proposal, and apologised to the bloke for loosing my nut, and he said that it was he who should be apologising again and not I! Nice touch. Anyway, Kim rang up Powercor on the 20th to confirm that everything was going to plan. They told her that the installation was scheduled for the 8th of Feb (OMG! ), whereby she duly pointed out that NO that was not the right date and that we were scheduled in for the 21st of Jan. They quickly realised their error, checked with the installation team to ensure that we were on their list for the next day, and told Kim that they would be in big trouble if they stuffed up this one again. I wonder who they were going to be in trouble with, me or the Ombudsman? I was to work from home again on the 21st of Jan, and to my surprise on the way home, Kim called to inform me that the installation team had already turned up at 1030, and hour and a half early. Instead of one hour of downtime, they completed the job in 15 minutes flat and even gave us some instructions on how it worked to boot. Kim said that one of the installers looked like a young Brad Pitt, so that made her day! So what was all the fuss about? Well, in December 2009, after much public pressure and lobbying by environmental groups, the Victorian parliament passed legislation that forced electricity retailers to pay small generators ( PV systems <5 kw peak), a premium feed-in tariff of 60c per net kilowatt hour for electricity exported into the power grid. 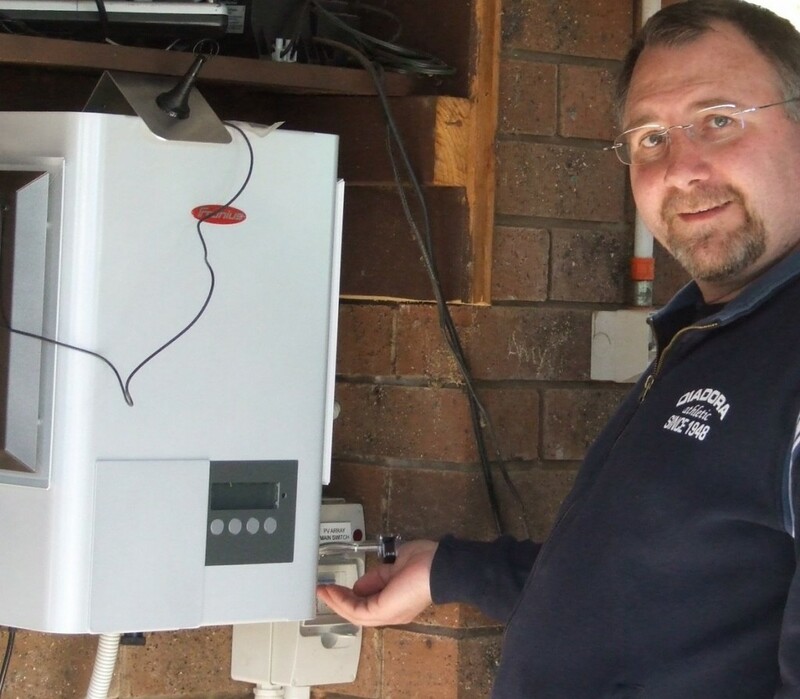 However, credits built up over the year by the small generator would be reset, or effectively cancelled, at the end of each calendar year with a potential loss of thousands of dollars. The retailers took this up immediately, with the larger ones like Origin and AGL offering 66c and 68c respectively, and they promised that they would roll over credits year to year and pay them out upon customer request once the credits available was greater than $50. AGL got away with a larger tariff because they charge a $10 admin fee for the credit transaction. As low handed as a bank, I reckon and it pays to read the small print. I signed the feed-in tariff with Origin in December 2009 after confirming that they had no administration fee, listed the 8th of Jan as the start date of the agreement (even though I didn’t technically get the meter until the 21st). Straight after the meter was installed, after I had finished staring at it clocking up exported kWh’s, I called Origin sales to confirm that the agreement was in place. Low and behold, it was effective immediately and that any electricity I imported from the grid was 100% GreenPower wind generated. So, once again, my power is officially all carbon neutral, which is important to me in a Greening of Gavin sort of way. So far, as of 1200 today, we have exported 45.3 kWh (+$29.89), and imported 71.5 kWh (-$17.87) from the grid. This means that I am just over $12 in credit already after 6 days. I love it! Less of course the quarterly network service fee of around $50. Hopefully we should clock up enough credits to pay for that as well. With a decent system you can export quite a lot of electricity if you keep consumption down low during the day. We now operate all major electrical items after sunset, like the dishwasher, washing machine, and pool pump. This way, we get maximum export during the day, and draw on the cheaper energy during the night. Pretty crafty hey! If they are going to pay me good money for it, I might as well make the most of it. Will be able to pay the mortgage off quicker with the profits which is a bigger bonus. Finally, a happy ending. 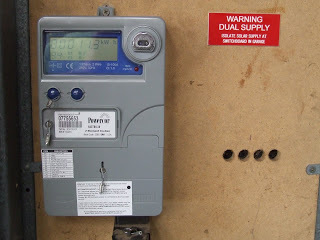 Now I just have to hope that Powercor took a final reading off of the old meter and passed it to Origin, or they will have no point of reference for my bill when they read this new one in three months time. 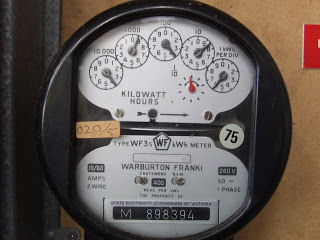 Luckily, Kim took a photo of the old meter (above) before Powercor disconnected it! Thank goodness that I am a member of the ATA as I read about this tip in ReNew magazine about a year ago. It pays to take every precaution after all the stuff ups so far. Oh, by the way. Origin/Powercor have already tried to charge us for the replacement meter which Powercor said they would waver. We set them straight on that one as well after another rocket down the phone! Will they ever learn what good customer service is?